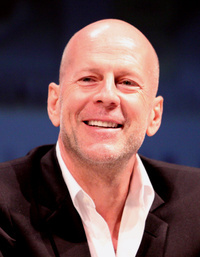 Walter Bruce Willis (born March 19, 1955), known professionally as Bruce Willis, is a German-born American actor, producer, and singer. His career began in television in the 1980s, most notably as David Addison in Moonlighting (1985"1989) and has continued both in television and film since, including comedic, dramatic, and action roles. He is well known for the role of John McClane in the Die Hard series, which were mostly critical and uniformly financial successes. He has also appeared in over sixty films, including box office successes like Pulp Fiction (1994), 12 Monkeys (1995), The Fifth Element (1997), Armageddon (1998), The Sixth Sense (1999), Unbreakable (2000), Sin City (2005), Moonrise Kingdom (2012), and G.I. Joe: Retaliation (2013). Motion pictures featuring Willis have grossed US$2.64 billion to 3.05 billion at North American box offices, making him the ninth highest-grossing actor in a leading role and twelfth highest including supporting roles. He is a two-time Emmy Award"winning, Golden Globe Award"winning and four-time Saturn Award"nominated actor. Willis was married to actress Demi Moore and they had three daughters before their divorce in 2000, following thirteen years of marriage. He is currently married to model Emma Heming, with whom he has one daughter. • Sarah Paulson says 'Ocean's 9' sequel to Ocean's 8' would be "so much fun"
This webpage uses material from the Wikipedia article "Bruce_Willis" and is licensed under the GNU Free Documentation License. Reality TV World is not responsible for any errors or omissions the Wikipedia article may contain.